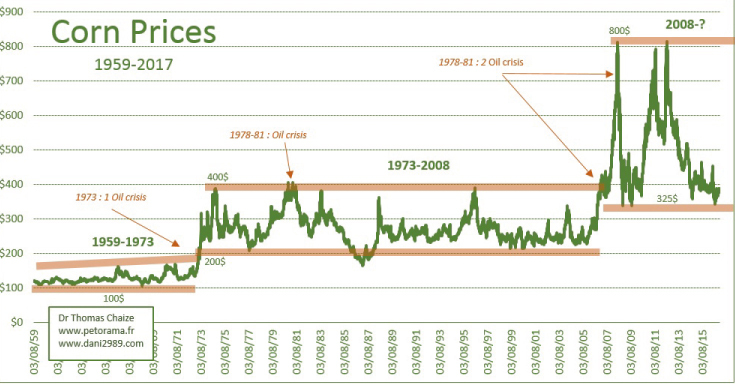 Corn Price: Technical analysis from 1959 to present. I. History of the price of maize: 1959-2017. 1. From 1959 to 1973. The price of corn has a fixed support to 100 dollars. The summits rose from $ 130 in 1961, to $ 161 in 1961, to 168 in 1971. The exit of the canal takes place during the summer of 1973. 2. From 1973 to 2008. From 1973 to 2008 the price of corn remains in a channel between $ 200 and $ 400. The corn course came out of its channel, which was more than three decades old in 2007-2008. The new channel appears to be between $ 325 and $ 800 per tonne of corn. 4. The crises of oil. I find it particularly interesting that the price of maize came out of its price channel in 1973 during the first oil shock. Then, 35 years later, maize comes out again from its price channel at the time of a strong increase in the price of the barrel ... At the moment that one could call the third oil shock. II. The price of corn today. 1. Support at $ 325 per tonne. I am writing a topic on corn today precisely because corn is close to a very interesting medium. This support is in the $ 325 (plus or minus) area. This support seems to me very solid. 2. Resistance at $ 450 per tonne of corn. 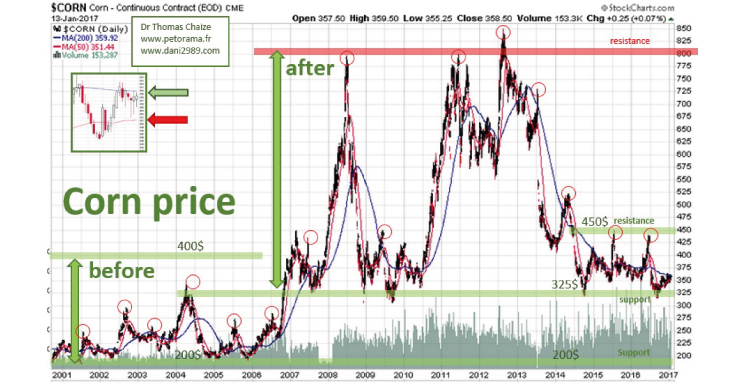 For two years the price of corn stumbled in June on a resistance located at $ 450. 3. Moving averages at 50 and 200 days. Currently, the price of corn is blocked between its MM50 and MM200. If the price falls below the MM50 it is a negative signal in the short term, if it passes over the MM200 this is very positive. The price of a barrel of oil seems to build a beautiful hollow in the head shoulders. Who bets that corn follows black gold? III. The future of the price of corn? 1. In the medium term. In the short to medium term, the channel between 325 and 450 dollars should be monitored. The rupture of the support at 325 dollars would be a very negative signal. 2. In the long term. In my opinion, when the price of a barrel will return to that summit in the next few years, the price of maize will return to the $ 800 a tonne. The new long-term corn price channel appears to be between $ 325 and $ 800. That's why the support is specially monitored at $ 325. 1. Wheat is in a very similar situation to corn. 2. Keep an eye on oil. 3. It is very important to monitor the support at $ 325. In the very long term, the world population is increasing, arable land is declining, the western lifestyle is adopted by the developing countries and the price of oil increases (tractor, fertilizer, etc.). The agricultural sector is in a trough, but the fundamentals are bullish.